With even more happiness than before, Kailiyah Hauser demonstrates her love for nature and everything kind by posing near the Sage Creek trees while talking about her life. I was sitting in English class having a bad day. I remember Kailiyah Hauser, a girl I vaguely knew, passing my table. I felt something light drop behind me, but I didn’t think anything of it. My friend Sara told me that something had fallen behind me, so I turned around and picked it up. It was a light blue sticky note. It read: “You’re such a wonderful person, and you impress me constantly! If you ever need someone to talk to or a friend, I’m always here.” I was stunned. No one had ever done anything of the like for me. No one else I knew took the time to write thoughtful notes for others. The note filled me with appreciation and happiness that I rarely experienced during school hours. 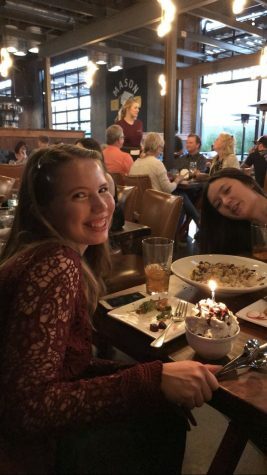 Hauser and her longtime best friends enjoy her birthday dinner before heading to the Fall Formal. Hauser’s birthday was on the same day as the dance this year. Later, I found out that Hauser had noticed that I looked sad, and had purposefully written the note to make me feel better. Very few people take the time out of their day to do random acts of kindness like Hauser. But every girl has a story behind her. Hauser’s parents were high school dropouts, she was in a near-death car accident as a small child, and a member of her family struggled with alcohol and heroin addiction. Additionally, Hauser dealt with severe obsessive-compulsive disorder and a difficult move to San Francisco. Despite all of this, Hauser has used her surroundings and her situation to flourish and accomplish things beyond what she ever imagined. “I’m excited to be a first generation person graduating from college… the main purpose of my life is to be able to understand the world around me. Before I graduate from high school, I want to maintain my straight A record,” Hauser says matter-of-factly. Unlike most high school students, Hauser spends her free time reading. “I like to read a lot, whenever I get the chance [it’s] what I’d rather be doing,” Hauser says with a smile on her face. Besides her passion for academics, Hauser is also loved by the people around her. One of Hauser’s best friends, Leah Scheble, found it easy to compliment Hauser. “Kailiyah is just a really good person, she is caring,… sympathetic and a good friend. She is fun to hang out with but she also knows when to focus on school,” Scheble says. Hauser is applying to several universities, including Stanford, with the goal to major in biology. “I like researching and studying and I like learning,” Hauser says with a smile and a laugh. But even with her ambitions, Hauser makes sure to maintain a balanced life. On top of all of this, Hauser still manages to find time for her job at Sprouts, along with being president of Space Club— a group of kids focused on a passion for astronomy and our galaxy— and secretary of Positivity Club. 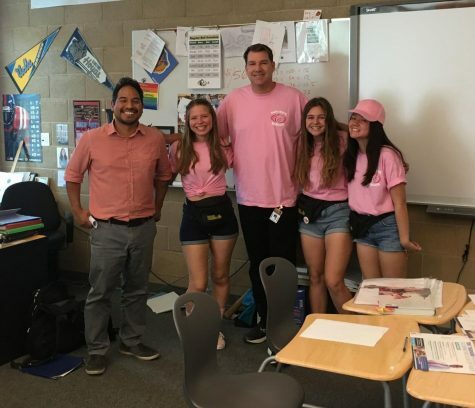 Social science teachers Tamayo and Bloomquist take a picture with Hauser and her friends on Breast Cancer Awareness Day. Hauser formed a long-lasting friendship with her teachers throughout high school. Social Science teacher Vicente Tamayo has become close with Hauser over the years. In this way, Hauser is loved by teachers and peers alike. Her “modest” yet confident nature does not go unnoticed. 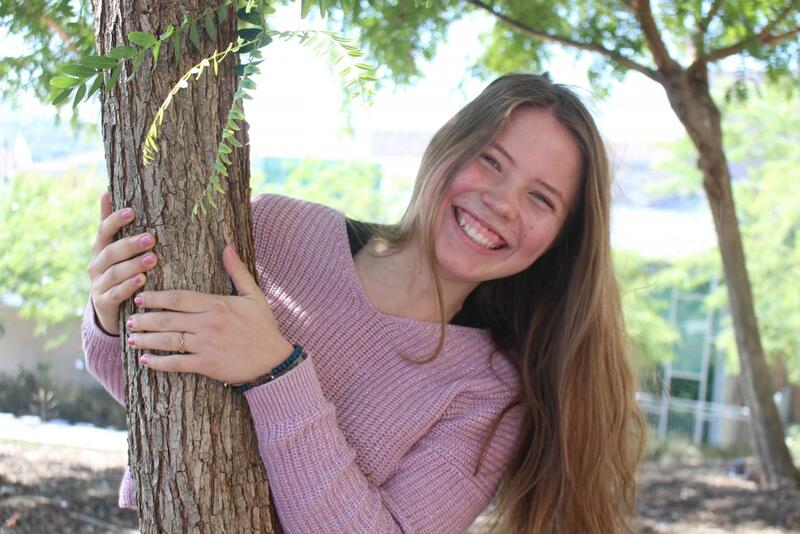 However, the most important thing of all to recognize about Hauser is the pure joy, happiness and kindness that she radiates around our campus. With her signature smile and laugh, Hauser is spreading the sunshine of positivity around Sage Creek one step at a time. I love Kailiyah, she is awesome and her quizlets rock too!